Bob Wright, FASF Airfield Security Chief, hooks up the new U.S. Border Patrol Designed Runway Weed Drag assembly. 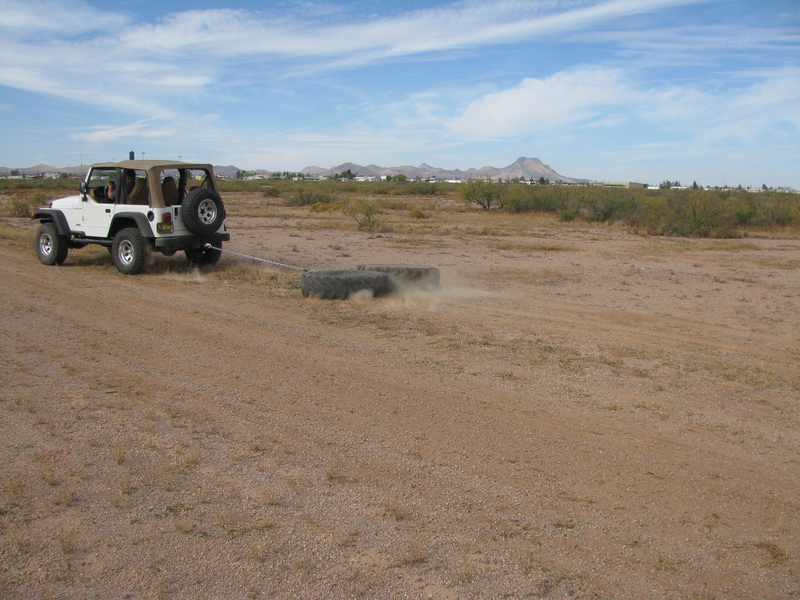 The U.S. Border Patrol (USBP) Headquarters (HQ) in Deming, NM volunteered to help us keep our 1st Aero Airfield clear of weeds and other dangerous desert overgrowth by assembling one of their dirt roadway drags, which they use regularly to keep their network of special USBP dirt roads clear on their daily area sweeps. 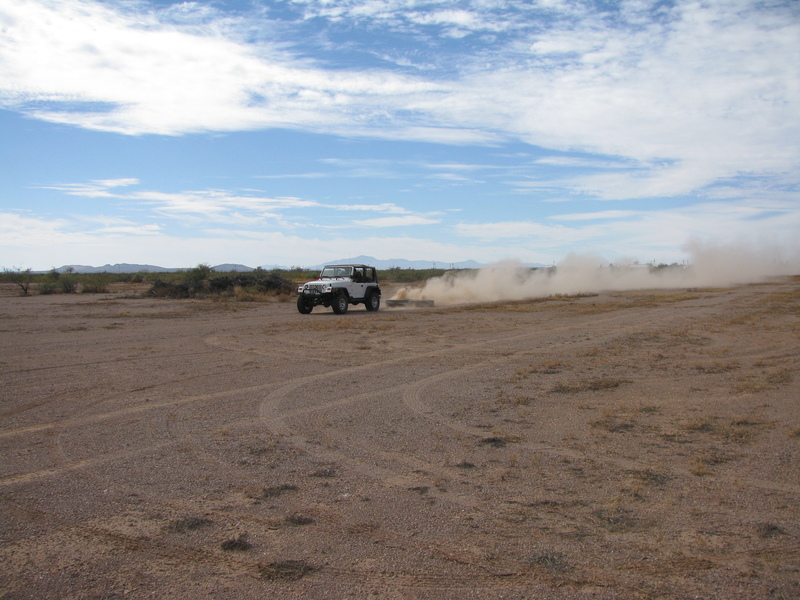 USBP HQ Officer Jeffrey Northrup coordinated the project and Field Officer Ivan Lechuga and his crew assembled and then delivered the drag to the Airfield. 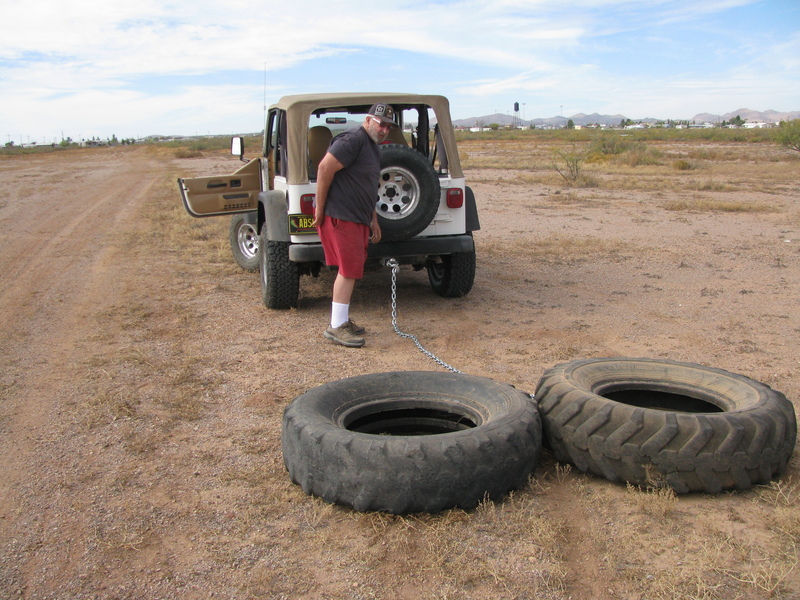 The drag is made of two large heavyweight used truck tires (see above) attached to the tow chain by large welded steel plates placed inside each tire and directly connected to the chain itself through holes drilled in the front center of each tire. Bob starts out on his first drag with the new terrain clearing tire drag. Heading to the West at full throttle, Bob picks up speed. All of these photos can be seen full size by clicking on them. Bob noticed that a plume of dirt rose up inside each truck tire and entered the inside of the tires, filling them with dirt and increasing both their weight – and efficiency – as he progressed. If you click to enlarge the above photo, and look closely, you will see that dirt wave immediately above the tire closest to the camera as it enters the tire itself. This shot shows both the Airfield Windsock (above and behind Bob’s Jeep), and the town of Columbus in the background to the Northwest, with the city’s landmark historic black water tower to the left above the trail of dust. The FASF wants to take this opportunity to again thank the Deming HQ USBP station and its officers Northrup and Lechuga for their generous public community service contribution towards helping the Foundation keep its runway clear of dangerous weed and tree growth through the use of its newly fabricated roadway/runway drag unit. We also want to thank Bob Wright for donating the use of his Jeep, the gas – and time – it took to accomplish this major runway maintenance project, the first time it’s been done since the initial grading and restoration of the old Columbus Municipal East-West runway itself in 2013, Further views, including aerial, of the newly cleaned runway and other volunteer restoration projects at the historic Airfield will appear in upcoming new posts to the FASF website. All FASF on site projects since 2013 have been done by the FASF’s dedicated staff of volunteers from Columbus, Deming, Santa Teresa, Las Cruces, NM, and El Paso, Texas. This entry was posted in HOT NEWS! on November 27, 2017 by FASFRIC. How Nice, by the BP and Bob Wright.